Plaza de Catalunya in Barcelona (Plaça Catalunya or Plaza Cataluña) is the nerve center of the city. It is considered by all its most central point and also joins the famous district of Eixample to the Ramblas and the oldest part of the city. Plaça Catalunya is also surrounded by hotels near the square. And you ask yourself: But there are hotels on Plaza Catalunya? Can I sleep there? Yes! But in the square? Yes! But there are also many hotels near Plaza Catalunya. And about to say around, because as you will now see Plaça Catalunya is surrounded by many different streets, which allows 4 or 5 minutes walk you are in the Plaza Catalunya. Plaça Catalunya is Spain’s third largest square. It measures 30,000 square meters. 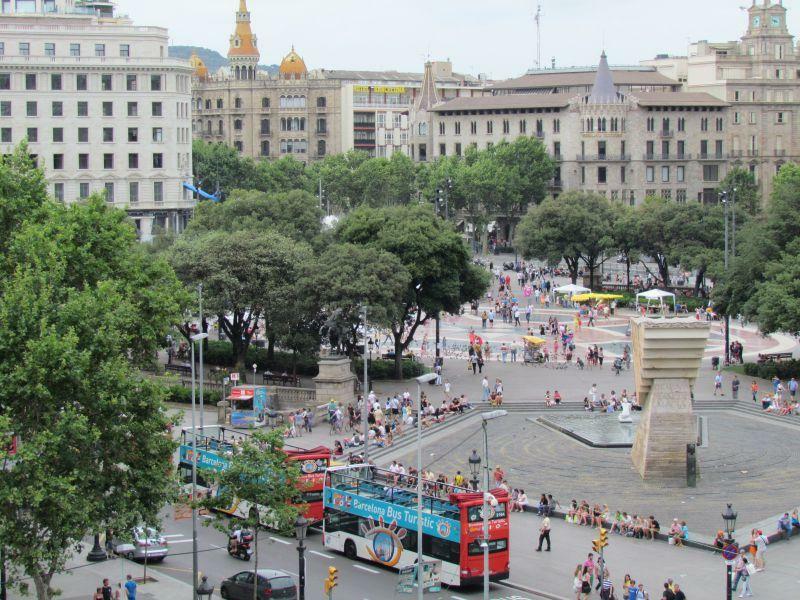 Plaza Cataluña is surrounded by Las Ramblas, Paseo de Gracia, Rambla de Catalunya, the Ronda Universitat, Ronda Sant Pere, Pelai Street and Avenida Portal del Angel, one of the main areas for shopping in Barcelona. It is a simple accommodation that offers you the privilege of sleeping in Las Ramblas of Barcelona, the most famous Street in the city, just in the most centrally located point, in Plaza Catalunya. The Barcelona City Hotel (Hotel Universal) offers a hotel with a great value for money just two blocks from Plaza Catalunya. The BCN City Hotel offers rooms with private bathroom, air conditioning, heating, High speed free wifi or gel, shampoo and soap size XL, among other details. Another good option is the Barcelona City Centre. A hostel more than a hotel, but where your needs will be met. Rooms with private bathroom, free wifi, access point (computer with internet connection), refrigerator in all rooms … What more could you want?. Sleeping in the center of Barcelona, ​​in a privileged area.